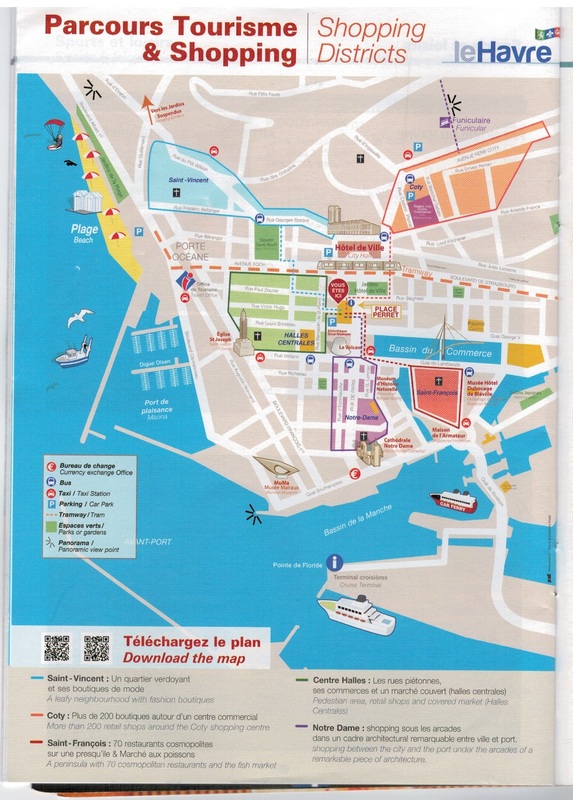 The facilities dedicated to passengers are situated in tidal dock directly at the port entrance. The gangway can be pretty steep and long. The physically impaired will be assisted. From the ship's dock to the city of Le Havre it's about a 25-minute somewhat boring walk. About 4 km. Most cruise lines offer shuttles to the center of town, mostly at no charge. but only announce this the night before, so not to disturb their excursion sales. Costa Cruises charges a whopping 13 Euro for this short shuttle. A taxi for two will be more cost effective. If the port itself offers their own shuttles it will be only 8 Euros. Taxis to the town center are 8 Euro, to the train station 10 euro. Fixed price. Bike rental is 10 euro/day, Car rental is available, starting at 90 euro/day. Cruise ships calling at Roger Meunier Pier will be overlooking the city center rebuilt by Perret, listed by the UNESCO as a world heritage site. Out of many services the new Cruise Welcome center has to offer Tourist & practical information ( free brochure "Le Havre tourism & shopping" ), Touring services, free WIFI, a few shops. On port days there are taxis lined up. Small sightseeing trains also depart from port, when a cruise ship is calling. 10 Euro. Paris is about 2-3 hours away. A cruise ship organized excursion is recommended. Watch a destination video of Paris. The bustling French port of Le Havre offers a selection of sights including Granville Abbey, St Adresse Fort and the Seine Estuary. However 1 or 2 hours in general will be plenty to visit Le Havre itself. Its position also makes it the perfect gateway to some of Normandy's most picturesque towns and villages, including the pretty harbor of Honfleur and inspirational Etretat - characterized by stylish mansions, sheer white cliffs and soaring waves that crash below. Bus lines 20, 39and 50 of the Bus Verts go from Le Havre to Honfleur in about 40 minutes. On Sundays and holidays bus services are limited. Around 5 euro each way, pay the bus driver each way as no return tickets are sold. Buses leave from the train station, a short taxi ride away or about a 500 meter walk from where the shuttle drops you off. Follow the signs "Les Gares", or take the tram. The trams cost 1.50 Euros for any journeys taking up to one hour. Bus 50 leaves around 12.40 to Honfleur and Bus 20 leaves Honfleur at around 4 pm. About a 30 minute ride over the Pont de Normandie. Please be in time at the bus station as when all seats are full, the bus will depart often not allowing standing places. Often this is the case when more than one cruise ship is in port. Due to the fact that you only get tickets from the bus driver often the buses depart an half an hour late. Le Havre City Sightseeing Tour. 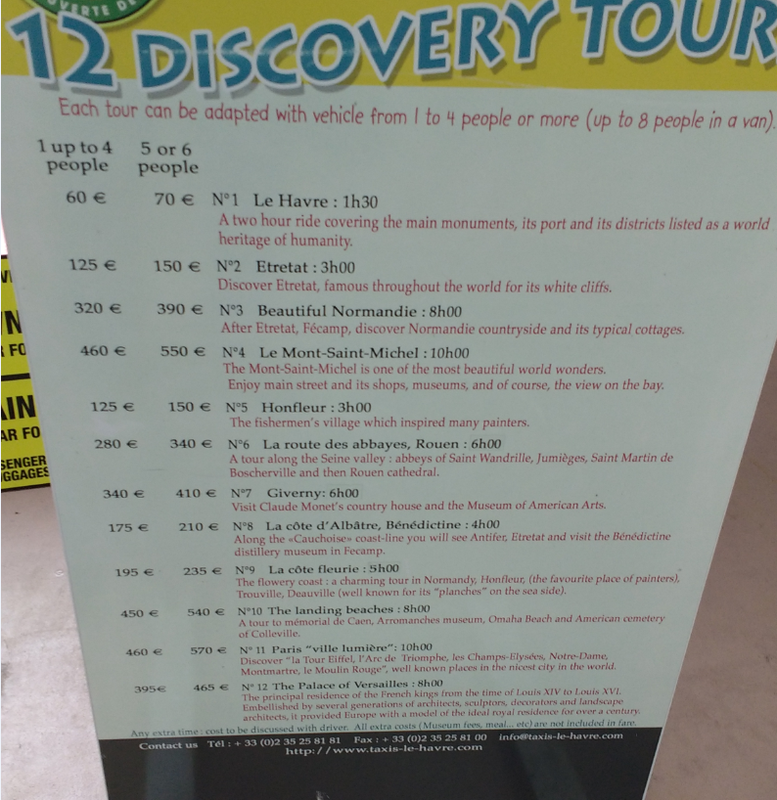 During 1 hour and 20 minutes, you will enjoy an amazing City Tour and panoramic view of Le Havre . You will explore all the large city of Le Havre and discover its history of 500 years with audio-guided comments. Honfleur: just on the other side of the river Seine. Rouen with its half-timbered houses, churches and cafés the Cathédrale Notre-Dame, which is well worth a visit. Also nearby is the Old Marketplace were Joan of Arc was burnt at the stake in 1431. Only a 55 minute train ride away. Check the train schedule carefully, as for day and time, as french train timetables are difficult to decipher. Paris (about 200 km from Le Havre): most cruise lines will offer a guided tour, which is a good idea if this your first time to Paris. and/or will offer 'transportation only' to the center of the city, a great way to explore Paris your way. Doing it that way: the subway (metro) is an excellent way to get around as are the buses. the many hop-on-hop-off tourist buses and even the 'free' bikes or rented bikes (specially in summer and in weekends when there is less traffic in the city). Or the shuttle boat Batobus or maybe even a private cruise on the Seine? Taking the train to Paris: The train station of Le Havre is about 30 minutes walk away from the cruise terminal or a 10 minute taxi ride. 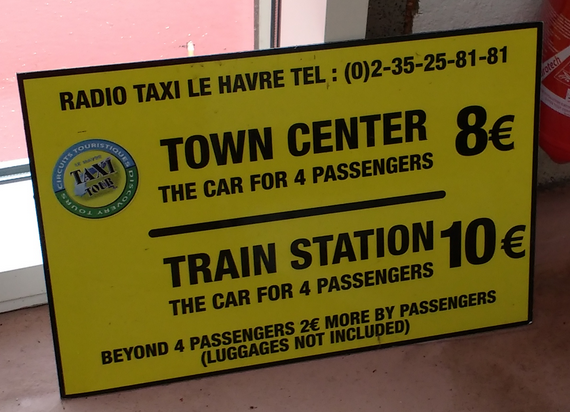 It is easily doable, but do not take the last train back, as there will not always be taxis available at the train station in Le Havre. The train ride takes about 2 hours. Euro 31 one way pp. Sometimes specials are available. Normandy is an heaven for the culinary tourist: apples: the cider and the calvados; milk and cream: the camembert, livarot and pont-l'évêque cheeses. Many dishes are made with cider or calvados: rabbit cooked in cider, pork with calvados and apples, etc. The brand new shopping center des Docks Vauban has plenty sidewalk cafes. Inside the shopping center is free WiFi and comfortable seats to use your laptop/tablet. It is just a few blocks from the train station. The new cruise terminal free Wifi. Wait till the crew has left the terminal for a better connection.